Babblings of a Mommy: Hana Thermal Protectant & Chi Silk Infusion Review. Hana Thermal Protectant & Chi Silk Infusion Review. Have you heard of Misikko? They are a place to shop and compare the best professional styling tools and beauty products like the Hana professional 1'' flat iron or the T3 Toumaline evolution dryer. They believe in finding the right salon tools & products for the right prices. If you haven't already, you need to check them out. Their prices are AH-MAZING! Misikko was kind enough to send over 2 styling products for me to try out. Shine Shield is a thermal serum that can be used as a leave-in conditioner - lightweight and never greasy, it protects and strengthens hair whether you use it with a flat iron, hair dryer or alone. This baby left my hair feeling super soft and silky and it smells so good! It's a serum that you can put on wet or dry hair and use it as often you like. You can even put it on your skin to make it feel like buttah! It contains Jojoba oil which naturally brings out your natural color overtones and highlights.--I absolutely loved this stuff! 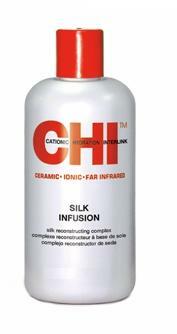 CHI Silk Infusion™ - Reconstructing Complex is specially formulated for thermal styling and hair repair. CHI Silk Infusion contains no alcohol, so it won't dry your hair out as a leave in treatment - and it'll leave your hair with the head-turning, lustrous shine of pure silk. I have thick frizzy hair so this puppy is like a magic pill for my hair. It completely eliminates my frizzy hair and gives me smooth, shiny results.--Great Product! Be sure to enter the giveaway on the giveaway post!